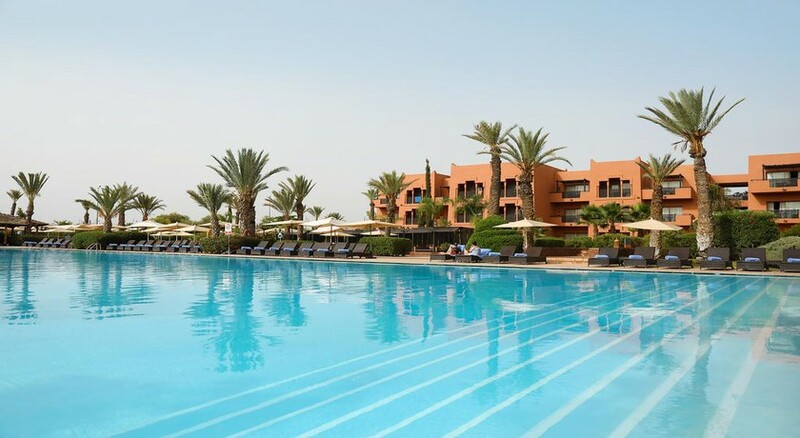 Kenzi Menara Palace is a jewel of hospitality and luxurious all-inclusive accommodation based on a 10-acre property in Marrakech. With an outdoor swimming pool, well-equipped fitness centre and one visit per stay free to the sauna or hammam, the hotel looks forward to usher its guests into an oasis of unmatched luxury. Immaculate, well-appointed guestrooms offering magnificent views of the Atlas Mountains, come with all modern amenities such as air-conditioning flat screen satellite TV, Radio, desk; several children's games with remote control, choice of 100 films, Wi-Fi, safe, mini-bar, coffee maker, direct dial telephone, en-suite bathroom with bath and shower. The property houses three spectacular restaurants serving delicacies from around the world. 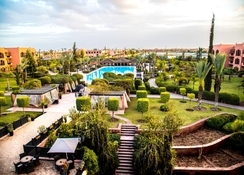 Kenzi Menara Palace is located amidst lush gardens only 5km from the Jamaâ el Fna Square, a 10-minute drive. The AL Mazar Mall is only 1.4km from the hotel, while the International Automobile Circuit Moulay El Hassan is 1.5km. The Menara Airport is only 5km from the hotel’s doorstep. Providing invigorating views of the Atlas Mountain, the 236 well-appointed rooms and suites are spacious and come with a private veranda. They come in categories like deluxe garden view, deluxe pool view, triple room, family room, senior suite garden, senior suite pool and two-bedroom suite. While the exteriors feature Arabo-Andalusia architecture the interiors are painted in tasteful colours, accents of wengé carved wood and rich materials exuding an unmatched oriental charm. The units come with air conditioning with individual climate control; flat screen satellite TV, radio, desk, several children's games with remote control, choice of 100 films, Wi-Fi, safe, mini-bar, coffee maker, direct dial telephone, en-suite bathroom with bath and shower. The hotel has a clutch of restaurants and bars providing an amazing dining experience against the exquisite backdrop of snow-capped Atlas Mountains. The L’Orientaliste is lounge with vintage décor serving Tapas and exotic cocktails by the pool. Saoussane is a Moroccan restaurant serving authentic dishes infused with spices and its subtle flavours in an oriental setting. The Out of Sight, Out of Mind restaurant (Insense), serves South of France cuisine in a delightful al-fresco setting backed up by Atlas Mountains. There are also lovely bars to relax with cocktails. Kenzi Menara Palace has two swimming pools (one indoor) and kids’ pool and terrace besides access to the lush gardens. There is a fully equipped gym with personal trainer for those who wish to stay active. There is a lovely spa with steam room and hammam offering massages and therapies. Tiny tots can have fun at kid’s club or playground. The hotel has facilities for aerobics, table tennis and tennis. Guests can also shop at the shops on-site. There is lively evening entertainment too.